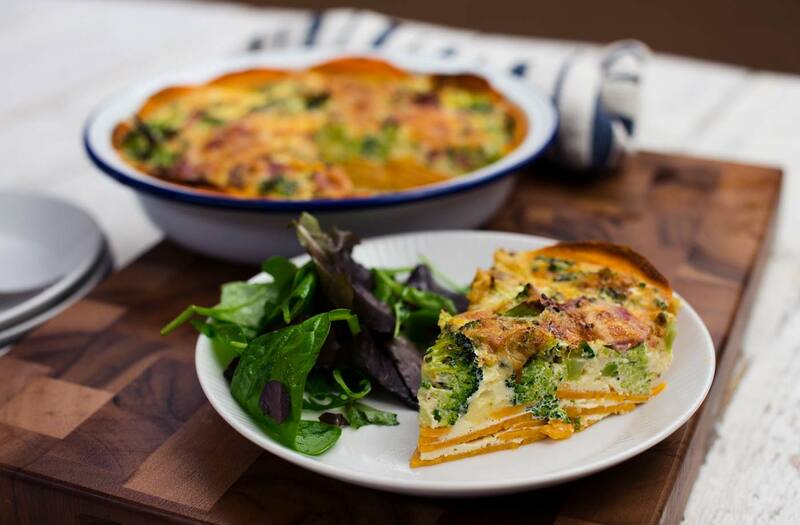 For this tasty twist on the traditional quiche, layers of sweet potato replace the typical pastry crust and make for a lighter yet equally delicious alternative. It’s great straight from the oven with a fresh green salad for a family dinner, and also perfect chilled for a picnic or your next ‘bring a dish’ party. Preheat the oven to gas 4, 180°C, fan 160°C. Blanch the broccoli florets for 2 mins in a pan of boiling water, then drain and set aside to cool slightly. Use the oil to grease a pie dish then layer slices of sweet potato to form a base. Halve some slices and place up the sides to form the edge of the pie ‘crust’. Bake for 15 mins, then remove from oven. Whisk the eggs and milk in a jug; season to taste. Add the broccoli, ham, chives and 60g of the cheese and pour the mixture over the sweet potato base. Scatter over the remaining cheese and bake for 50-55 mins until cooked through and golden. Leave to cool in the dish for 10 mins, then remove and cut into wedges to serve. Tip: This recipe works equally well with a variety of fillings – try swapping the ham and broccoli for shredded chicken and garden peas.